After the California gold rush in 1894, the attention turned to farming. Soon irrigated agriculture flourished aided by federal policies in settling the West and providing water supply. It continued to expand with favorable water rights and policies, advancements in irrigation technologies, and imported water supplies. The need of subsurface drainage was long understood but failed to materialize due to lack of collective actions. 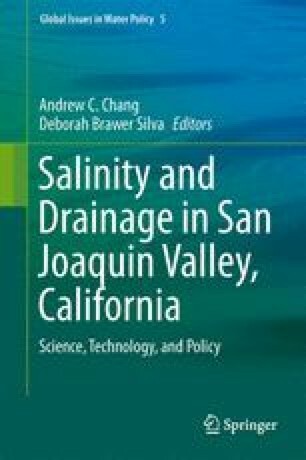 The salinity drainage predicament in the San Joaquin Valley culminated in the selenium eco-toxicological harms further complicated the disposal issues. DWR (California Department of Water Resources). (2009). History of the California state water project. http://www.water.ca.gov/swp/history.cfm. Accessed June 2012. Robie, R. (1988). The State Department of Water Resources, 1975–1983. California oral history (54pp). eBook and Text Archive, California Digital Library. http://archive.org/details/statedeptwater00robirich. Accessed May 2013.